I’ve been traveling around the beautiful country of Ecuador for about 3 months now, mostly in the Central Andean Highlands. Life in the Andes is unlike any I’ve ever seen. At 8,000-14,000 ft above sea level, the weather is very cold and wet for days on end with moments of intense heat as the sun shows herself ever so briefly. The clouds are extremely thick and can quickly blanket an entire community, making visibility almost impossible at times. The predominately indigenous residents of the Andes are by far the hardest working people I have ever encountered. They spend their lives almost completely outside. And during the winter months that means farming, cooking, washing their clothes, showering and everything else involved in daily life, on a hillside in the cold, windy weather. After spending a few weeks wandering through the Highlands, one thing I missed more than anything was the ocean. I’ve spent my whole life on the water and around boats. I’ve spent months at a time at sea and to this day it’s the one place where I’m the most at peace. 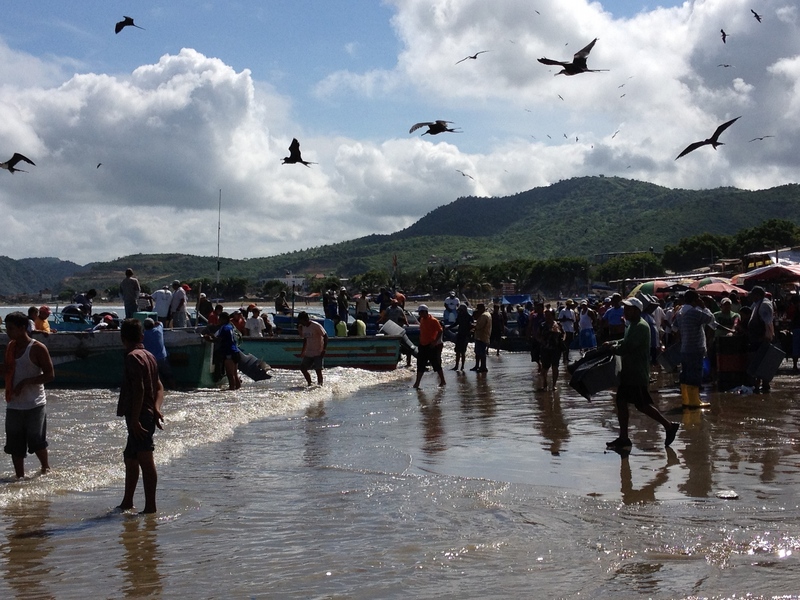 I’m sure there are many great places on the coast, but I chose a small fishing town called Puerto Lopez. The main draw is a tiny island off the coast called “Isla de la Plata” (Silver Island), also appropriately nicknamed the “Poor Man’s Galapagos” because it has some of the same rare plant and animal species as the Galapagos, but at a much, much cheaper price. 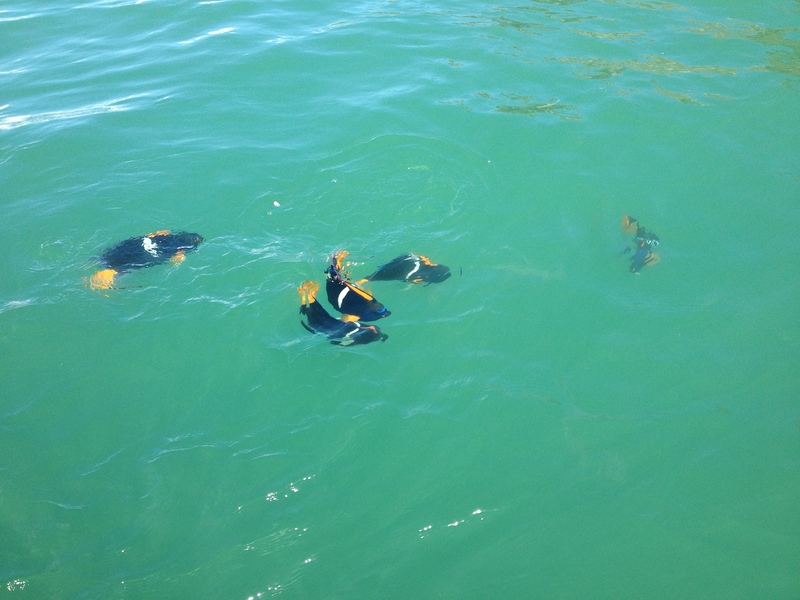 To do a day trip out to the island required a couple of nights stay in Puerto Lopez. 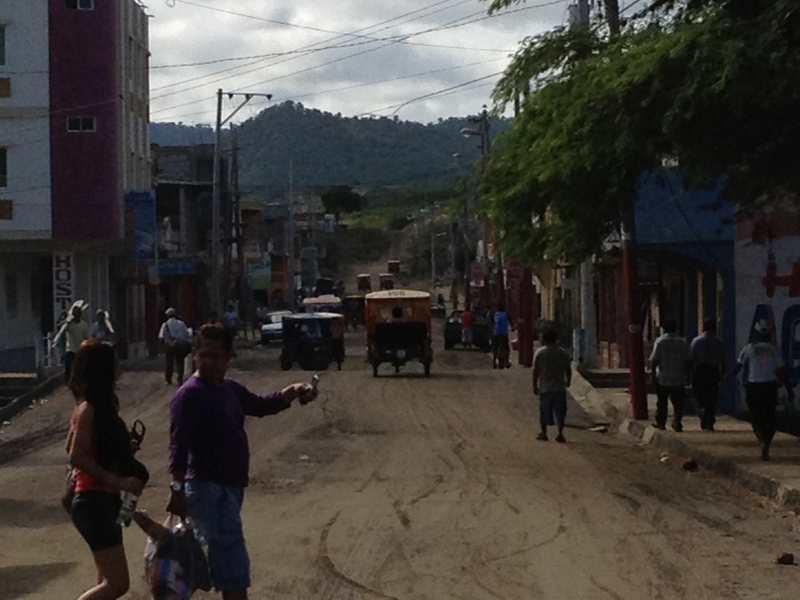 All the articles I read along with my guide book made Puerto Lopez out to be kind of disappointing. As I recall, one article stated “not much to see” when describing the town. But the past 4 days have been amazing and Puerto Lopez has to be one of the most interesting towns I’ve been to thus far on my Ecuadorian travels. 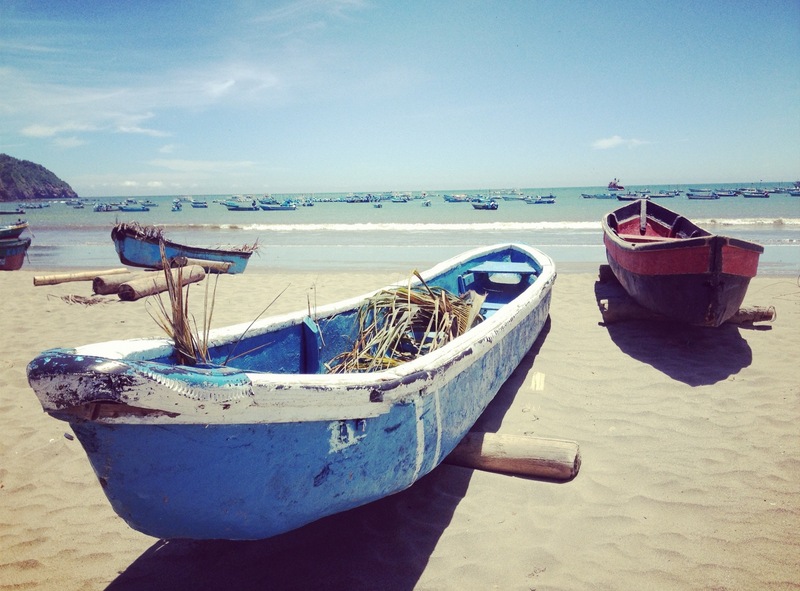 It’s small-town, South American coastal life at its most charming. In just a few hours I went from 10,000 ft in the cold Andes to the hot, dusty, laid-back beachy lifestyle on the coast where daily life revolves around fishing and lounging in a hammock. It almost seems a law that one has to hang a hammock in front of the house and lounge at least 4 hours a day in it. 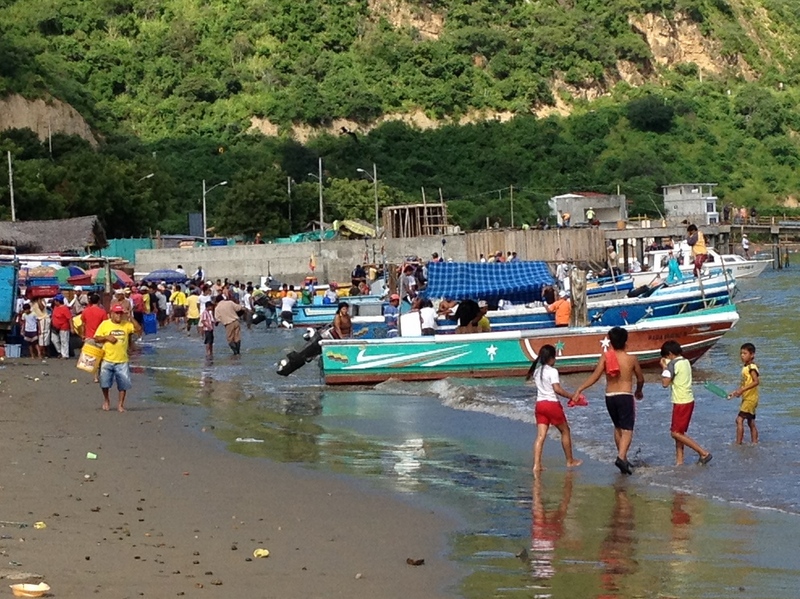 The town hugs a small bay on the Pacific that offers protection for fishing boats. 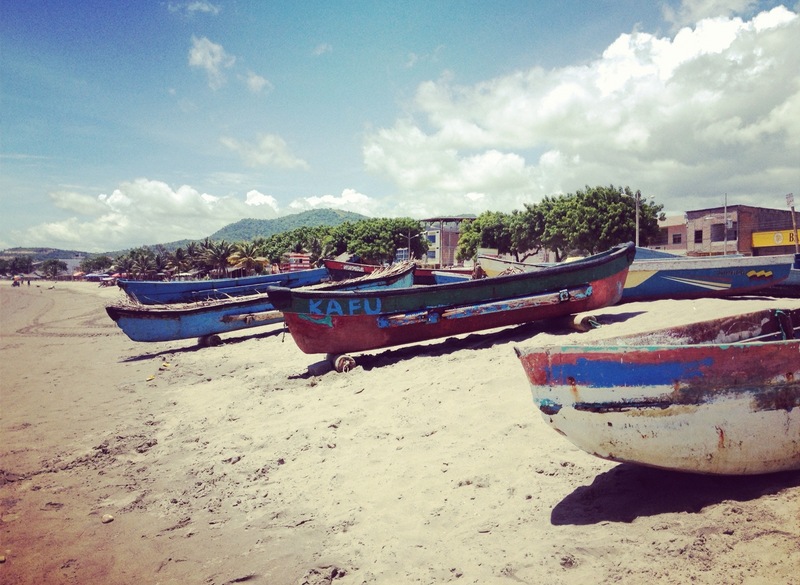 All the fisherman in town have small, handmade wooden boats and keep them in the same area of the beach, just a few feet from shore. Every morning before dawn they go out and by the time they come back to unload their catch, the beach is swarmed with people waiting for them. There are food stalls already set up and ready start cooking their catches and there are people sitting at tables, waiting for a fresh fish breakfast. 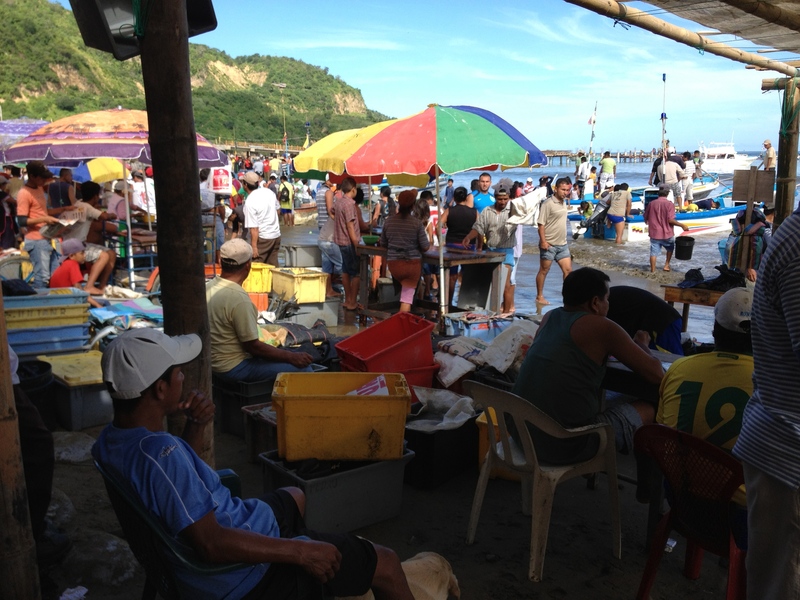 The beach is also lined with restaurant workers waiting to buy the necessary amount of fish for their daily patrons. It’s really a beautiful site to see so many people live off of nature so simply. 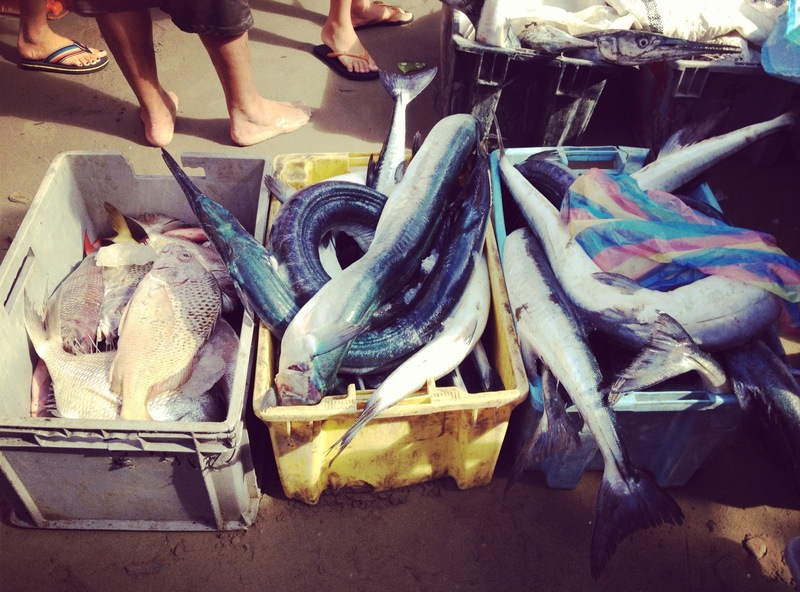 I asked one of the fishermen in the market what types of fish they caught and the most I could make out was “all kinds”. But I did a bit of research and the main ones are amberjack, dolphin, wahoo, marlin, and tuna. Another characteristic I found in people here is their unwillingness to lie or embellish. For example, I wanted to go diving so I went into a dive shop and asked a man behind the counter how the visibility was in Puerto Lopez. His response “No es bueno” (It’s not good). I walked out without a reservation and a little shocked at how utterly truthful he was. I’d like to think he cared more about my experience in Puerto Lopez than he did about getting a little extra business. It was really refreshing. Another example occurred when, after a traumatizing incident with a scorpion my first night in town, I decided to switch hostals. The first place I found, I asked the hotel keeper if he had a problem with insects. “Hay insectos aqui” (There are bugs here) was his response. I don’t remember the rest of his answer in Spanish but it was something about a lot of rain this year, and it’s the coast of Ecuador, and so on. Needless to say I appreciated his honesty and as I walked out to find another hotel. Third time’s a charm because the next place was perfect. For $5.00 extra dollars a night I could sleep bug/scorpion-free. 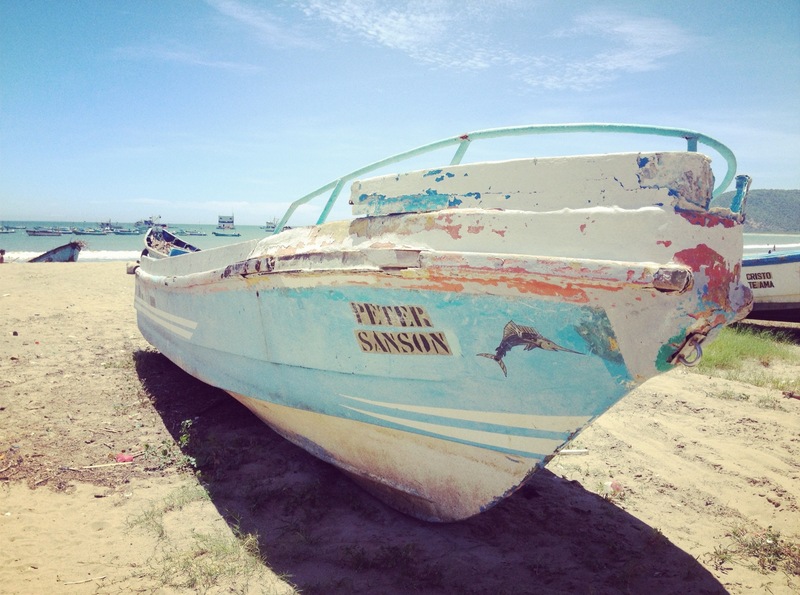 On the day of the Isla de la Plata tour, I met the boat (and a few other Gringos who opted for the same “Poor Man’s Galapagos” tour) on the beach next to the fish market. After boarding, the guide explained some of the rules of the tour. Guides always have a way of explaining things in the wordiest way possible. For example, instead of saying “If you have to go to the bathroom…” the guide said “If a biological situation presents itself…” Anyway, after a long-winded explanation of the rules, we set off for the Isla. Seeing the boat’s wake slowly disappear into the mountainous horizon and feeling the loud hum of her engines, I couldn’t help but feel a little nostalgic from my childhood. Some of my favorite memories include these senses. 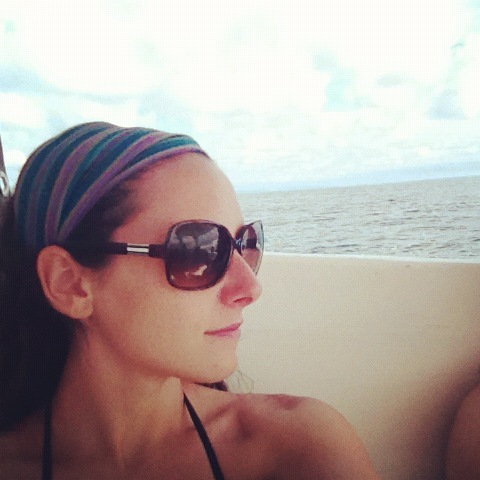 Everyone on board spent the entire ride out to the island practically in silence, just taking it all in. The hour-long ride was definitely a highlight of the tour for me. 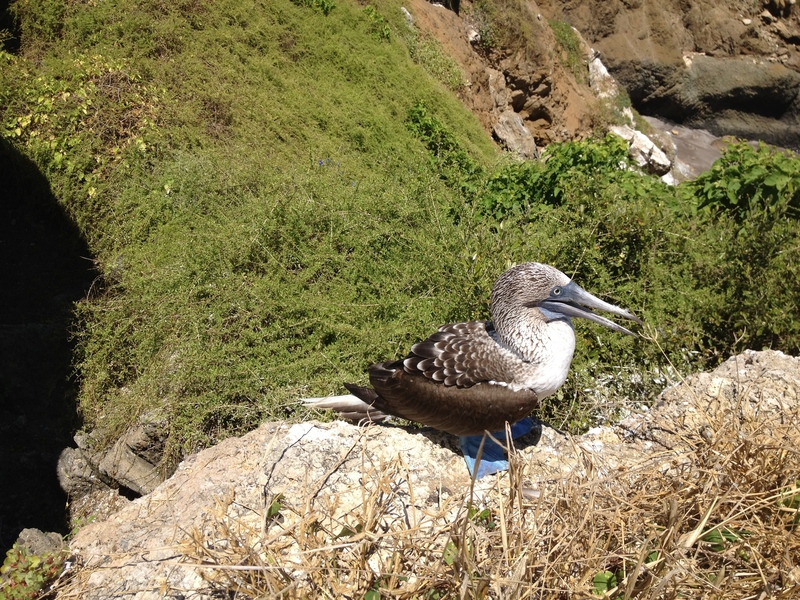 The main star of the tour was also the “blue-footed booby” bird that can only be found here and on the Galapagos. In addition to helping Charles Darwin discover Evolution, they are also famous for their bright blue feet. They are completely conditioned to humans and let us get really close for pictures. After a brief swim in the ocean we returned back to Puerto Lopez and I spent the rest of the day watching the sunset on the beach. And to fully immerse myself in Ecuadorian coastal culture, I did so in a hammock. 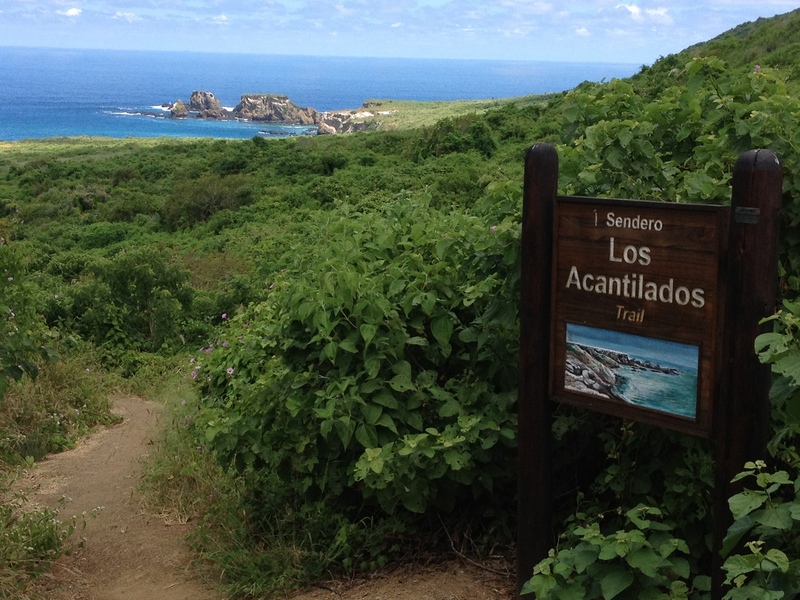 After getting my ocean fix, I’m returning to the Andes with a deep appreciation for Ecuador’s coast. 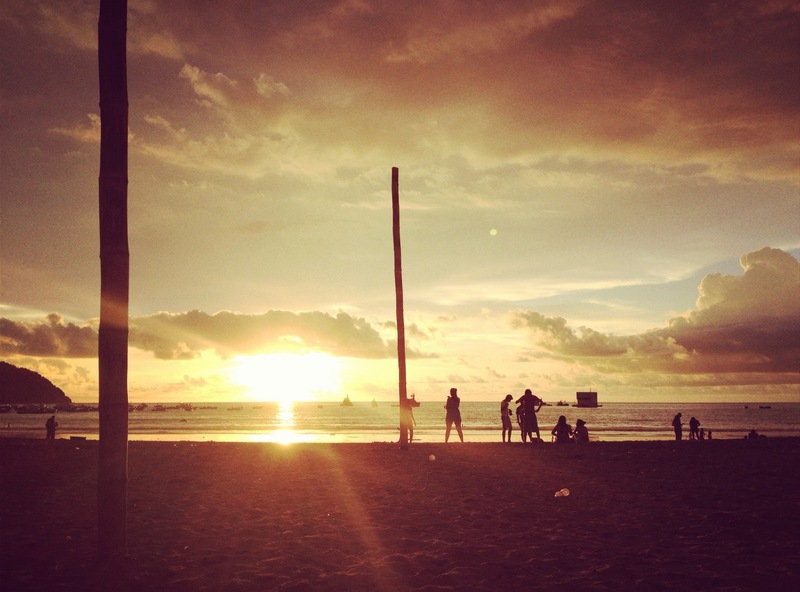 It’s more than just beach and sun and hammocks. 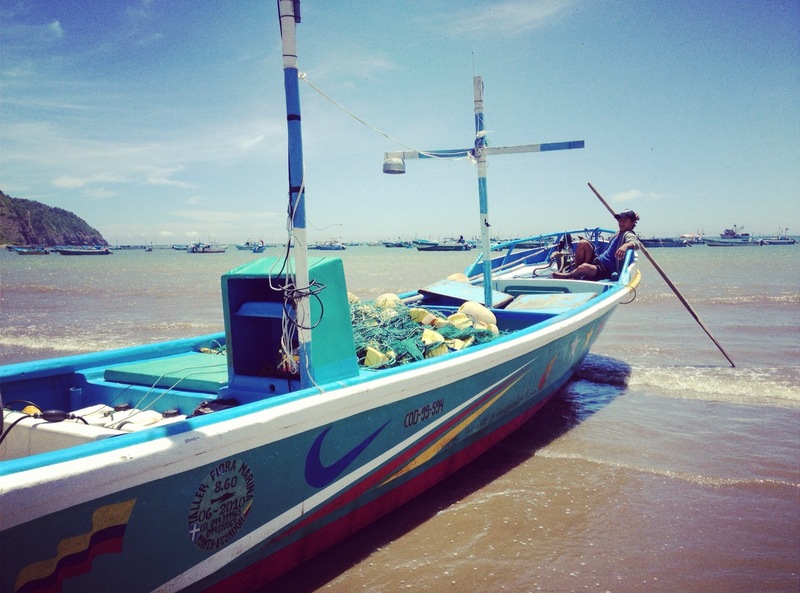 There is something really genuine and simple about the way coastal Ecuadorians live. I hope to carry their attitude on life back with me as I make my way down to Peru. You are such a great writer!! Enjoyed it. Have fun. Mom called last.night and LOVED her box that you sent her and Dad!! You are living my dream, keep up the great work. we love you and miss you. 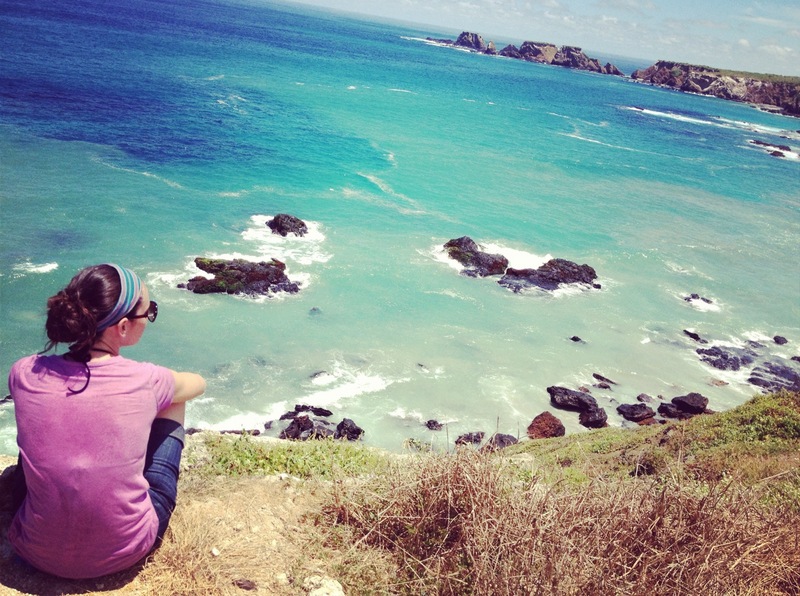 You are living my dream, we miss you love ya.. Outstanding pictures and commentary. A wonderful experience. Good article, I love the Andes climate, and the legitimately friendly honest people, but a more developed infastructure in Bogota. and Medellin,, my favorite @ 5000 ft elevation, I found the people of Bogota, much more, real, serious, and educated, with a realistic world view and understanding that I have never found in Florida. With level of consciouness that is higher and cost of living “”well””much less that Florida, with an economy that has never stopped growing when rest of world was shrinking in 2008-11, I chose to live there as an expatriate. But Americans need to remember in Colombia it’s all about drug dealers, kidnapping, murder and corruption because now there are few Americans there and that is probably a good thing for me…Panama and Costa Rica safer.